Joanne Milton is the owner of Rustic Meadows in Hillsburgh, Ontario. 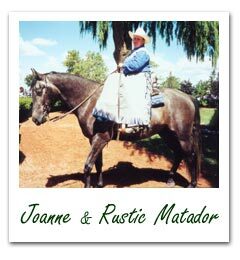 She has been teaching riding for over 30 years and breeding Reining prospects since 1995. Joanne has been a Canadian Equestrian Federation Level 1 Western Coach since 1996. She received her Judge/Instructor certification from the World Sidesaddle Federation Inc in 2000, the first Canadian to do so. The lesson schedule at Rustic meadows is very flexible and lessons are custom tailored to suit each individual student. Joanne specializes in beginner riders, teaching the "balanced seat", and its variations. Students are taught the basic riding positions & learn to understand the mechanics behind all the very exciting reining maneuvers. She likes to expose newcomers to the many available disciplines in the horse industry, so they may make their own choices about which they would like to pursue. Once a student begins to specialize, she will help them find a coach in their chosen field, unless of course, they choose Reining or Sidesaddle -- Joanne's own specialties. Some of her former and current students are competing very successfully in Reining, Dressage, Hunter/Jumper, Western Games, Western Pleasure and Trail. One of her students in now the second Canadian to have WSFI Judge/Instructor certification. She does not push competition though, and many students are just enjoying their contact with horses. Horses from the Rustic Meadows Breeding Program are being enjoyed by their new owners and are beginning to make their mark in the show pen. Joanne also does custom sewing, specializing in custom Western Show Shirts & Jackets.